TomorrowWorld teams up with Bridges For Music for its "Love Tomorrow" contest. Clubbers will have the opportunity to take action and donate to Bridges for Music for the chance to win one-of-a-kind on site experiences at this year's TomorrowWorld in Chattahoochee Hills, Georgia in just a couple of weeks. Additionally, this contest will also debut the new limited edition TomorrowWorld x Electric Family charity bracelet. You can take action by subscribing to the Bridges for Music newsletter, purchasing the charity bracelet, or watching the TomorrowWorld trailer to earn points. Those points will then be entered into a raffle to win a Belgian Feast with Hardwell or a meet and greet with Armin van Buuren, plus a helicopter tour of TomorrowWorld. Depending on which actions you take, they will receive a different amount of points. Bridges For Music is a non-profit organization gathering key players of the music industry to support its responsible development in developing countries, leaving a positive impact in disadvantaged communities and helping to raise global awareness about local issues through music. It has been a charity partner for TomorrowWorld for the past two years. 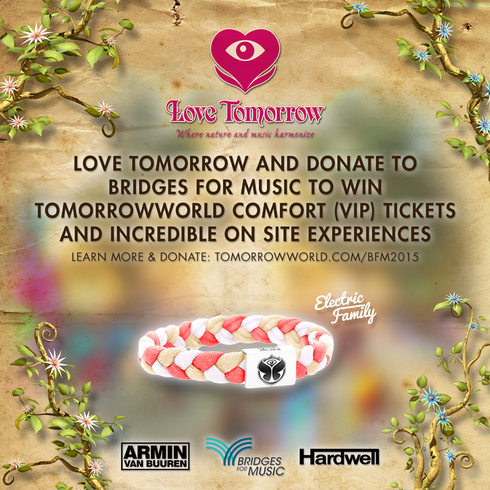 Enter TomorrowWorld and Bridges For Music's "Love Tomorrow" Contest Here: http://bit.ly/1MemUOm.